It is time for Alexander Pope, the foremost poet of the new Augustan age, to be more widely appreciated. Pope offered his contemporaries a new way of thinking about classical themes and was responsible for a profound change in attitudes to nature and the landscape. His doctrine, 'In all, let Nature never be forgot', is strikingly relevant now that we are aware of the need to protect the planet from man's excesses. Pope's all-embracing reverence for 'the Works of Nature' has given his country a lasting witness to his philosophy - the natural landscaped garden. The wonderful gardens at Stowe, Studley Royal, Rousham, Stourhead, Painshill and Mount Edgcumbe all remain to testify to his idea of life in harmony with nature. His famous dictum, 'Consult the Genius of the Place in all', continues to serve us well in environmental planning today. This book is a unique look at Pope's relationship with the leading garden makers of his time. Forever planning and plotting for his own grotto and for his modest, though famous, five acres in Twickenham, his ideas were also sought at many of the great estates. His importance to Lord Burlington at Chiswick, Henrietta Howard at Marble Hill and, above all to William Kent, the great designer who finally 'leaped the fence, and saw that all nature was a garden', is made abundantly clear. 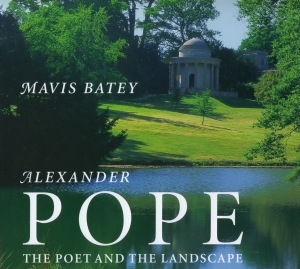 As ever, with her profound feel for both literature and landscape, Mavis Batey throws a refreshing and rewarding new light on her subject and shows why Pope has been, and remains, so crucial to our landscape. As with all Barn Elms books the historical images and specially taken photographs serve to enhance the reader's enjoyment and understanding of a fascinating and hitherto obscure subject. Mavis Batey is the President of the Garden History Society and widely known for her work on behalf of the conservation and understanding of historic gardens and the landscape in which they sit. During the Second World War she worked as a code-breaker at Bletchley Park and her flair for connections has been a feature of her writing, whether on Oxford gardens, Lewis Carroll or Jane Austen ever since.